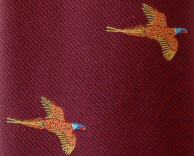 Children's tie featuring a flying and standing pheasant motif on plain background. These children's ties are available in two colours. Made in the UK. Children's Pheasant Tie on a woodland background.